William's New Year's Day is from Crompton's Just-William short story series (1922), illustrated by Thomas Henry. William went whistling down the street, his hands in his pockets. William’s whistle was more penetrating than melodious. Sensitive people fled shuddering at the sound. The proprietor of the sweet-shop, however, was not sensitive. He nodded affably as William passed. William was a regular customer of his—as regular, that is, as a wholly inadequate allowance would permit. Encouraged William paused at the doorway and ceased to whistle. “’Ullo, Mr. Moss!” he said. “’Ullo, William!” said Mr. Moss. “Anythin’ cheap to-day?” went on William hopefully. Mr. Moss shook his head. “Twopence an ounce cheapest,” he said. “That’s awful dear,” he said. “What isn’t dear? Tell me that. What isn’t dear?” said Mr. Moss lugubriously. “Well, gimme two ounces. I’ll pay you to-morrow,” said William casually. “Well, gimme them now then,” said William. “They wouldn’t be no New Year’s gift then, would they?” he said. Mr. Moss took out a handful of assorted fruit drops and passed them to William. William received them gratefully. “An’ what good resolution are you going to take to-morrow?” went on Mr. Moss. “You’ve got to have a good resolution for New Year’s Day,” said Mr. Moss firmly. “Same as giving up sugar in tea in Lent and wearing blue on Oxford and Cambridge Boat Race Day?” said William with interest. “You might take one to do your school work properly,” he suggested. “Or—to keep your clothes tidy?” went on his friend. William shuddered at the thought. Williams crammed two more sweets into his mouth and shook his head very firmly. “Crumbs, no!” he ejaculated indistinctly. William was struck with this. “What’s yours?” said William, putting four sweets into his mouth as he spoke. Mr. Moss looked round his little shop with the air of a conspirator, then leant forward confidentially. “I’m goin’ to arsk ’er again,” he said. “Asked what?” said William, gazing sadly at his last sweet. “Arsked to take me o’ course,” said Mr. Moss with an air of contempt for William’s want of intelligence. “Ter marry me, I means,” said Mr. Moss, blushing slightly as he spoke. Mr. Moss merely sighed and popped a bull’s eye into his mouth with an air of abstracted melancholy. He met his father on the stairs as he went down to breakfast. His father looked down at him suspiciously. At breakfast William’s politeness shone forth in all its glory. “Can I pass you anything, Robert?” he said sweetly. His elder brother coldly ignored him. “Going to rain again,” he said to the world in general. His mother looked at him anxiously. “No. I’m bein’ p’lite,” he said irritably, then pulled himself up suddenly. “I’m quite well, thank you, Mother dear,” he said in a tone of cloying sweetness. After breakfast he received his pocket-money with courteous gratitude. “He’s goin’ to ask her again,” volunteered William. “Who ask who what?” said Mr. Brown, but William had departed. He was already on his way to Mr. Moss’s shop. Mr. Moss was at the door, hatted and coated, and gazing anxiously down the street. “Goo’ mornin’ Mr. Moss,” said William politely. Mr. Moss took out a large antique watch. William was inspecting the sweets with the air of an expert. William gasped. The offer was almost too munificent to be true. “I’ll do anythin’ for that,” he said simply. Mr. Moss was certainly in a holiday mood. William pinched himself just to make sure that he was still alive and had not been translated suddenly to the realms of the blest. Mr. Moss, with a last anxious glance at his watch, hurried off in the direction of the station. William was left alone. He spent a few moments indulging in roseate day dreams. The ideal of his childhood—perhaps of everyone’s childhood—was realised. He had a sweet-shop. He walked round the shop with a conscious swagger, pausing to pop into his mouth a Butter Ball—composed, as the label stated, of pure farm cream and best butter. It was all his—all those rows and rows of gleaming bottles of sweets of every size and colour, those boxes and boxes of attractively arranged chocolates. Deliberately he imagined himself as their owner. By the time he had walked round the shop three times he believed that he was the owner. At this point a small boy appeared in the doorway. William scowled at him. The small boy stood, as though rooted to the spot. William pressed into one of his hands a stick of liquorice and into the other a packet of chocolate. William’s invective was often wholly original. He had already come to look upon the Resolution as a kind of god who must at all costs be propitiated. Already the Resolution seemed to have bestowed upon him the dream of his life—a fully-equipped sweet-shop. He wandered round again and discovered a wholly new sweetmeat called Cokernut Kisses. Its only drawback was its instability. It melted away in the mouth at once. So much so that almost before William was aware of it he was confronted by the empty box. He returned to the more solid charms of the Pineapple Crisp. He was interrupted by the entrance of a thin lady of uncertain age. William answered as well as the presence of five sweets in his mouth would allow him. “I can’t hear a word you say,” she said—more frigidly than ever. William removed two of his five sweets and placed them temporarily on the scale. “Gone,” he said laconically, then murmured vaguely, “thank you,” as the thought of the Resolution loomed up in his mind. She looked at him with distinct disapproval. William looking round the shop, realised suddenly that his own depredations had been on no small scale. But there was a chance of making good any loss that Mr. Moss might otherwise have sustained. He looked down at the twopenny bars. “Shillin’ each,” he said firmly. “Gone up——?” she repeated indignantly. William’s manner of fulsome politeness seemed to madden her. She glared at him with vindictive triumph. William met her eye calmly. It is a great gift to be able to lie so as to convince other people. It is a still greater gift to be able to lie so as to convince oneself. William was possessed of the latter gift. William put out his tongue at her, then returned to the shop and closed the door. Here he discovered that the door, when opened, rang a bell, and, after filling his mouth with Liquorice All Sorts, he spent the next five minutes vigorously opening and shutting the door till something went wrong with the mechanism of the bell. At this he fortified himself with a course of Nutty Footballs and, standing on a chair, began ruthlessly to dismember the bell. He was disturbed by the entry of another customer. Swallowing a Nutty Football whole, he hastened to his post behind the counter. The newcomer was a little girl of about nine—a very dainty little girl, dressed in a white fur coat and cap and long white gaiters. Her hair fell in golden curls over her white fur shoulders. Her eyes were blue. Her cheeks were velvety and rosy. Her mouth was like a baby’s. William had seen this vision on various occasions in the town, but had never yet addressed it. Whenever he had seen it, his heart in the midst of his body had been even as melting wax. He smiled—a self-conscious, sheepish smile. His freckled face blushed to the roots of his short stubby hair. 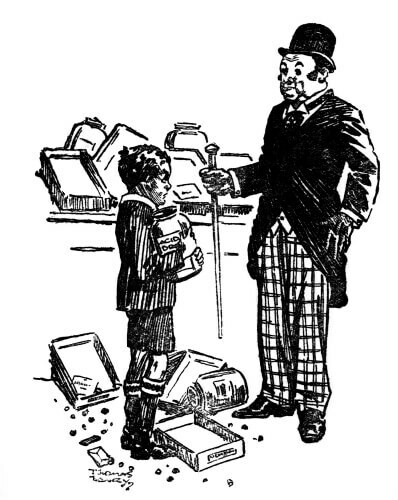 She seemed to find nothing odd in the fact of a small boy being in charge of a sweet-shop. She came up to the counter. Her voice was very clear and silvery. Ecstasy rendered William speechless. His smile grew wider and more foolish. Seeing his two half-sucked Pineapple Crisps exposed upon the scales, he hastily put them into his mouth. She laid four pennies on the counter. “Please, I haven’t any more money,” gasped a small, bewildered voice. “’Cause it’s New Year’s Day?” said the vision, with a gleam of understanding. She gazed at him in admiration and envy. “I’d love to have a sweet-shop,” she said wistfully. “Well, you take anythin’ you like,” said William generously. She collected as much as she could carry and started towards the door. “Sank you! Sank you ever so!” she said gratefully. William stood leaning against the door in the easy attitude of the good-natured, all-providing male. He stopped, simply for lack of further expressions, and bowed with would-be gracefulness as she went through the doorway. As she passed the window she was rewarded by a spreading effusive smile in a flushed face. She stopped and kissed her hand. William blinked with pure emotion. He continued his smile long after its recipient had disappeared. Then absent-mindedly he crammed his mouth with a handful of Mixed Dew Drops and sat down behind the counter. As he crunched Mixed Dew Drops he indulged in a day dream in which he rescued the little girl in the white fur coat from robbers and pirates and a burning house. He was just leaping nimbly from the roof of the burning house, holding the little girl in the white fur coat in his arms, when he caught sight of two of his friends flattening their noses at the window. He rose from his seat and went to the door. “’Ullo, Ginger! ’Ullo, Henry!” he said with an unsuccessful effort to appear void of self-consciousness. They gazed at him in wonder. They peeped round the door-way cautiously and, reassured by the sight of William obviously in sole possession, they entered, openmouthed. They gazed at the boxes and bottles of sweets. Aladdin’s Cave was nothing to this. “Howd’ you get it, William?” gasped Ginger. They needed no second bidding. With the unerring instinct of childhood (not unsupported by experience) that at any minute their Eden might be invaded by the avenging angel in the shape of a grown-up, they made full use of their time. They went from box to box, putting handfuls of sweets and chocolates into their mouths. They said nothing, simply because speech was, under the circumstances, a physical impossibility. Showing a foresight for the future, worthy of the noble ant itself, so often held up as a model to childhood, they filled pockets in the intervals of cramming their mouths. A close observer might have noticed that William now ate little. William himself had been conscious for some time of a curious and inexplicable feeling of coldness towards the tempting dainties around him. He was, however, loth to give in to the weakness, and every now and then he nonchalantly put into his mouth a Toasted Square or a Fruity Bit. It happened that a loutish boy of about fourteen was passing the shop. At the sight of three small boys rapidly consuming the contents, he became interested. “What yer doin’ of?” he said indignantly, standing in the doorway. “You get out of my shop,” said William valiantly. “You get out!” said William. “Get out yerself!” said the other. “Yer would, would yer?” said the other, beginning to roll up his sleeves. “Yes, an’ I would, too. You get out.” Seizing the nearest bottle, which happened to contain Acid Drops, he began to fire them at his opponent’s head. One hit him in the eye. He retired into the street. William, now a-fire for battle, followed him, still hurling Acid Drops with all his might. A crowd of boys collected together. Some gathered Acid Drops from the gutter, others joined the scrimmage. William, Henry, and Ginger carried on a noble fight against heavy odds. It was only the sight of the proprietor of the shop coming briskly down the side-walk that put an end to the battle. The street boys made off (with what spoils they could gather) in one direction and Ginger and Henry in another. William, clasping an empty Acid Drop bottle to his bosom, was left to face Mr. Moss. Mr. Moss entered and looked round with an air of bewilderment. “He’s ill,” said William. “He couldn’t come. I’ve been keepin’ shop for you. I’ve done the best I could.” He looked round the rifled shop and hastened to propitiate the owner as far as possible. “I’ve got some money for you,” he added soothingly, pointing to the four pennies that represented his morning’s takings. “It’s not much,” he went on with some truth, looking again at the rows of emptied boxes and half-emptied bottles and the débris that is always and everywhere the inevitable result of a battle. But Mr. Moss hardly seemed to notice it. “I’m afraid there’s a bit of a mess,” said William, returning to the more important matter. Mr. Moss waved aside his apologies. Lunch? Quite definitely William decided that he did not want any lunch. The very thought of lunch brought with it a feeling of active physical discomfort which was much more than mere absence of hunger. He decided to go home as quickly as possible, though not to lunch. But it was not “quite all right” with William. Reader, if you had been left, at the age of eleven, in sole charge of a sweet shop for a whole morning, would it have been “all right” with you? I trow not. But we will not follow William through the humiliating hours of the afternoon. We will leave him as, pale and unsteady, but as yet master of the situation, he wends his homeward way. If you read this story around the holidays, you might also enjoy our collection of Christmas Stories for Children. Add William's New Year's Day to your own personal library.